Peoria Police are asking for help, after thieves broke into an elementary school for the eighth time in less than a year. A custodian noticed this most recent break-in Monday morning. From Phoenix, KJZZ’s Mark Brodie reports. The Phoenix area is the top market in the nation for gains in housing prices. The real estate tracking firm Clear Capital says the average price in the Valley rose nearly 10 percent in just the last three months. An Arizona State University professor is one of six international recipients being recognized for his study of the environment. The United Nations Champions of the Earth Awards were announced this morning in Rio de Janeiro. Former State Rep. Richard Miranda has been sentenced to more than two years in prison for stealing from the charity he once ran. Miranda, a Tolleson Democrat, suddenly resigned from the Arizona Legislature in February, citing family and health reasons. Just when the absurdism of alternative theater had begun to seem mundane, along came Elizabeth Meriwether’s Heddatron. The down-beat comedy, first staged off-Broadway by Les Freres Corbusier in 2006, and now staged by Phoenix’s Stray Cat Theater, is best known as “the play with the robots in it,” because … it has robots in it. State officials say about 2,100 low income children have so far enrolled in the new Kids Care II program, with many more applications pending. That’s as of the end of last week. This spring, three Arizona hospitals announced plans to combine their money, and draw down federal cash to fund the program for around 22,000 kids overall. The Arizona Supreme Court says a jury can consider lesser charges against a defendant, even if the defense and prosecution don’t want them to. The court’s unanimous ruling upholds a man’s conviction for manslaughter, even though prosecutors charged him with first-degree murder. 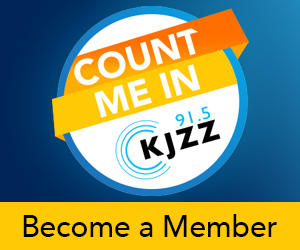 You're Still the OneThanks to you, KJZZ has been leading the way as one of the top radio stations in the Valley and one of the top 10 public radio stations in the country-- and you’re the number one reason for that success. Death of Tasered MCSO jail detainee ruled "undetermined"
Medical examiners in Maricopa County are ruling the death of Ernest "Marty" Atencio "undetermined." The Latino veteran died last December after being subdued and Tasered in a Maricopa County jail. From Phoenix, Devin Browne reports. As supplies of non-renewable resources dwindle and the cost of powering our cities continues to rise, KJZZ examines the most abundant energy source in Arizona—solar power. KJZZ, Rio Salado College and Greater Phoenix Mensa hosted a discussion about the Future of Solar Energy on May 18. Gas prices in Arizona continue to fall - they’re down again this week, and are now at a three-month low. From Phoenix, KJZZ’s Mark Brodie has more. MARK BRODIE: AAA Arizona says the average price for a gallon of regular, unleaded is now $3. More than 200 candidates for Congress, state Legislature and Corporation Commission have filed their petition signatures to qualify for the ballot. Wednesday was the deadline to get their signatures to the Secretary of State’s office, and starts a ten-day window for campaigns or their supporters to challenge those signatures. Central and Western Arizona are under an excessive heat warning from 10 a.m. to 8 p.m. Thursday and Friday. That could mean an increase in heat-related problems for emergency responders in metro Phoenix. Former assistant Maricopa County Attorney Lisa Aubuchon has lost her latest attempt to hold on to her law license. She was disbarred for a series of ethical violations. KJZZ's Al Macias reports.Aubuchon and former county attorney Andrew Thomas were disbarred in April for ethical violations in connection with failed prosecutions of county officials and judges. The Arizona Supreme Court will not hear a case dealing with whether the state’s Open Meeting Law apply to the Independent Redistricting Commission - at least not yet. From Phoenix, KJZZ’s Mark Brodie reports. KJZZ reporters Devin Browne and Mark Brodie talk about their work covering Arizona’s job market, and ASU economist Lee McPheters talks about what needs to change in the job market to get Arizona on the economic upswing. Wes Gullett, partner at the consulting firm First Strategic, and Bob Grossfeld, president and CEO of The Media Guys, talk about modern campaigning and candidates. Veteran political consultants Gullett and Grossfeld cover the gamut of campaigns and elections. Five years ago this month the Smoke Free Arizona act went into effect. A Valley bar owner and a health services expert talk about how the act changed the Arizona bar scene. Mark DeSimone, owner of the Hidden House Cocktail Lounge in Phoenix, says the Smoke Free Arizona act did more to hurt business and drive away customers in his bar than the recession or crackdown on DUI laws. Two children of a state lawmaker from Kingman have been arrested on felony drug charges. Five people, including 31-year-old Stephanie Goodale and 27-year-old Michael Goodale, were arrested last week after a three month investigation into heroin trafficking.